The government of Pakistan has increased commitment to social development and celebrating the achievement of Million Development Goal (MDG) in different health sectors, especially in the vaccination of children under the age ≥ 3 years .Its combination of 5 individuals vaccines, which are designed to protect against Haemophilus influenzae type B Tetanus, Hepatitis B, Whooping cough, and Diphtheria . The DTP containing the pentavalent vaccines are provided by UNICEF .Child vaccination UNICEF provides free in Pakistan, at 6 weeks, 10 weeks and, then at 14 weeks of age respectively . The government of Pakistan introduced the Expanded Program on Immunization (EPI) program in 2009 and after that it replaced with the (DTaP), Diphtheria, Tetanus, and Pertussis (also known as DPT) Hepatitis B vaccine [5,6]. The National Emergency Action Plan in 2017/2018 results showed that more than 39.3 million infant were vaccinated by almost 260,000 front-line vaccinators working in different districts of Pakistan with 2100 social mobilizers hence reducing the victims of polio by 98% since 2014. And 1.5 million children have been vaccinated at 378 permanent transit points . In 2014-2015, the vaccination campaign increased in all those areas where the basic health units  were not activated. It required secure infrastructure for vaccinators . When Pakistan was reviewed under the case of anti-governmental issues, and negative religious aspects, like children vaccines were decreasing the fertility of human beings so therefore that revelations fed into a claim by Islamic extremists . In 2012, 59 people were killed during a militant attack on a polio vaccination team which included the police. 187 victims were recorded by Pakistan National institute of health (PNIoH) and World Health Organization (WHO) . Pakistan social and living standards measurement survey (PSLM), stated that the children’s nutritional needs and the pre and post care of illiterate mothers is also lacking (Awareness of diseases and lack of treatment is a common phenomenon of parents. Probably use the herbals in villages as for the treatment of children’s against of pentavalent vaccine. And health profile is not encouraging the mentality of illiterate thinking of parents). The World Health Organization (WHO) and Pakistan government pay much more attention to the improvement of the quality of health . The Bacille Calmette-Guerin (BCG) vaccination campaign was launched and 43 million were treated since 1949 and was updated in 1970 [12-14].There are totally eight doses of which three doses of DPT have completely protect children against of pertussis, diphtheria and tetanus, three doses for polio vaccine and two doses protect against of Measles vaccination (BCG (anti-TB), anti-polio (drops) and DPT given by drops, not inject to children but after that government of Pakistan had introduced COMBO (1st , 2nd and 3rd) n which is combination of DPT and Hepatitis with instead of COMBO and also Measles 2nd, introduce along with BCG. Onward 2010 the government introduce PENTA (Diphtheria, Pertussis, Tetanus, Hemophilus Influenza B and Hepatitis B)). The BCG vaccination program was introduced in 1949 and has been part of an extended program of Immunization (EPI) up until 1970 . As per this program in 26 different countries, three areas have been assisted for carrying out BCG vaccinations, and 43 million people have been tested of which 16 million children among them have been vaccinated . Diarrhea has also been reported to be between 70% to 73% in the years 2012-2015 by rural health centers (RHC) . A national health survey revealed that in Pakistan only 21% of the households were able to take vaccination cards for children treatment in age of less than 23 months . Therefore due to lack of vaccination cards many families in rural areas couldn’t be able to be provided with the BCG vaccination . The full immunization rates have been elaborated by urban and rural areas of Pakistan from 2014 to 2015 (PSLM 2014-15 ) and 65 percent of children aged 12-23 months have been immunized by a type of antigen-based of 11 doses, BCG , Penta , Polio , HB , and 61% Measles  (Based on record from PSLM 2014-15 and specified immunization who have an immunization card) and ORS . The treatment of Diarrhea in children under 5 years was 94% and 75% in Diarrhea cases were reported by the ORS in Pakistan (ORS given within 30 days and recommend to mothers ORS was administered to child). As for 73% Diarrhea was treated in hospital, 17% in Government hospital, 5% in BHU and 1% by herbals. The purpose of this study to determine the immunized children from pentavalent vaccines with household education because their contribution taking most important part of development. The educated household treated their children very well comparatively illiterate and middle and low level of education. Pakistan plays an important role in vaccination by BCG. Pakistan reduces the number of infected patients from since 1954 and now 11 doses it eliminates from its roots. As for determination of that Pakistan has faced lots of security issues and takes front actions against of terrarium so for the effective implementation of new immunization strategies can be driven by the World Health organization and UNECF. This study was conducted using data from a household children survey in 2014-15. The study was based on four provinces (113 districts) of Pakistan. The provinces are Khyber Pakhtunkhwa (KPK), Punjab, Sindh and Baluchistan. There were 121 surveyors in four provinces; 27 surveyors in KPK, 38 surveyors in Punjab, 25 surveyors in Sindh and 29 surveyors in Baluchistan. The research study focused on whole-population sampling methods, the Sample size of the study was 67,726 from a population of 80,000. 84.65% of the results have been collected from the survey. There were 15000 questionnaires distributed in KPK, 30,000 distributed in Punjab, 20,000 distributed in Sindh and 15,000 distributed in Baluchistan. The questionnaires were based on 19 different questions. We selected 0-12 month’s children for pentavalent vaccines. Discrete information had been also compiled from the high risk districts like KPK and interior Sindh and generated information regarding polio vaccination along with pentavalent vaccines because there were lots of districts that did not have BCG (card holders) services for Children vaccination [13,14,18]. Data collection was conducted in rural, semi urban and urban settlements. Interviews were randomly conducted between males and females in each district with coordination of local police and Army . The survey enumerator carried out information from each household child by sub co-surveyors. In each province different numbers of co-surveyors were involved in the research survey as well. Interviews were conducted by 110 co-surveyors with 121 surveyors for 113 districts in Pakistan. Furthermore, in the KPK province 27 surveyors were allocated for 25 districts and in each district each surveyor collaborated with 20 co-surveyors in five sub groups. In Punjab 38 surveyors were allocated for 36 districts with 40 co-surveyors in eight sub groups. In Sindh 25 surveyors were allocated for 23 districts with 20 co-surveyors in five groups of individuals. In Baluchistan 31 surveyors were allocated for 29 districts with 30 co-surveyors in six groups individually. Surveyors compiled information separately from male and female individually. The separate interviews were designed to allow for a deep investigation and comparison between both respondents' answers to explore the possible hypothesis effects on children for vaccination and how the pentavalent vaccines are needed for children under the age of three years. At end, surveyors’ information was largely steady with certain dimensions (e.g. immunized children’s, participation community of BCG in districts, record of pentavalent vaccines with five vaccinations, diarrhea and uses of ORS). Enumerators opted for the responses of female based households from female elders. Lack of hospital facilities in districts have resulted in lots of the families taken up herbals and the use natural treatment for children’s. The households with females as head of household tend to take their children for vaccination and directly face health workers. The surveyor groups targeted at least one child under age of 5 in each family for pentavalent vaccine. Enumerators were hired male and female teams from the local districts for maximum entrée to respondents. The survey interview questionnaires was structure on 19 questions: Has child ever been immunized; do you have any immunization card for the child; which pattern of immunization was followed for the child; has the child receive BCG; has the child receive DPT/ Combo/Penta 1st; has the child receive DPT/Combo/Penta 2nd ; has the child receive DPT/Combo/Penta 3rd ; has the child receive Polio 1st ; has the child receive Polio 2nd ; has the child receive Polio 3rd ; has the child receive HB 1st ; has the child receive HB 2nd ; has the child receive HB 3rd ; has the child receive MEASLES 1st ; has the child receive Measles 2nd ; has the child suffer from diarrhea during the last 30 days; was any consulted for treatment of diarrhea; whom did you consult first and did you give the child ORS. A multinomial logistic regression model was performed with eight parameters without demographic questions (Table 1). A multinomial logistic regression model was performed the relationship between the predictors and variables (Table 3) with eight parameters (Immunization card , BCG , Penta , Polio , HB , Measles , Diarrhea , ORS ). The value of traditional .05 criterion of statistical significance was immunized for all tests. The predictors to a model that contained only the intercept significantly improved the fit between model and data, χ2(16, N=67726) = 16807.698, Cox and Snell R2=0.220, Nagelkerke R2=0.972 and Mc Fadden R2= 0.968, (Table 4) p< .000. Goodness of fit was explored by conducting Hosmer-Lemeshow tests for each pair of groups. The reduced model is formed by omitting an effect from the final model. The null hypothesis is that all parameters of that effect are 0. a. Unexpected singularities in the Hessian matrix indicate that either some predictor variables should be excluded or some merged. Model fitting information-based shows model fitting criteria in -2 Log Likelihood 17361.371 (Intercept only) with 16807.698 Chi-Square and significant level is .000 with 16 degree of freedom. Table 1: Multinomial logistic regression. Pakistan tribal areas is not too secure, therefore the surveyor has not conduct data much more information directly from the household family members in especially FATA but the local police have provided security as well in during survey. Furthermore, the lack of finance surveyor has not visited outside of villages. The level of household education was divided into three level; Illiterate, middle and highest level (The three parameter of education have been distributed on bases; Illiterate, Middle (Class 1 to 10, Diploma, FA/FAC/I.Com, Higher (BA/BSc/BEd/BCS, MA/MSc/MEd/MCS, Degree in Engineering, Degree I Medicine, Degree in Agriculture, Degree in Law)) of household education. According to surveyors, 53.6% in illiterate, 40.0% in middle and 1.35% in higher level entrant had not received BCG vaccination from whole population 24.4% (n=16519). The 53.91%, 40.68% and 1.31% children respectively had not received DPT/Combo/ Penta 1 in their individual levels of education from 25.8% (n=17473). The 54.01%, 40.62% and 1.31% children respectively (Parameter of education scale) had not received DPT/Combo/ Penta 2 in their individual levels of education from 27.80% (n=18832). The 54.21%, 40.44% and 1.30% children respectively had not received DPT/Combo/Penta 3 in their individual levels of education from 29.37% (n=19892) (taking from 27.93% of 67726). Additionally, the vaccination record of DPT/Combo/Penta 1, 2 and 3 also shows in Figure 1, the shaded region indicate the value of yes on recall, black line shows the yes on card and black line shows record of children who did not receive any vaccination in different provinces (The provinces data have been conducted from Table 2). Figure 1: The vaccination record of DPT/Combo/Penta given to children. Table 2: District distribution for variables. Maternal education and their child health have effectively related with each other and it creates direct influence on the concerning pathway of child growth especially the household education in low-and middle-income countries (LMICs). Like having children vaccination, better socioeconomic status and health relief of different vaccinations . This research indicates that whenever the household education is raised it has a direct influence on children’s health in the early period of growth. Likewise, the BCG vaccination was not reaching to children cause of lack of household education and even, they couldn’t recall the Health department in their own region. The illiteracy rate of BCG vaccination is 23.99% (There were 8870 and 6742 household participants from illiterate and Middle level of education have not taken BCG vaccination and even have not recall to the regional authority about it. The 23.99% increase in illiterate household as compare to middle level and 97.47% from higher level of household education). on middle level and 97.47% from higher level greater. Therefore, household were not vaccinating their children from BCG. The Bacillus Calmette–Guérin (BCG) vaccine has a protective effect against tuberculosis (TB) from the childhood . Annually 430,000 people including the 15,000 children involve in Tuberculosis (TB) and death rate not less than 70,000 per year. Pakistan was also assessed to be fourth highest pervasiveness (TB) globally and World Health Organization (WHO) Partners are promoting individual communities and less the death causes of BCG . The chairman of the World Mercury Project Robert F. Kennedy, Jr has indicated that the DPT vaccine should be provided to children at an early age for determined DPT link with autism . Meanwhile, the educated households should be vigilant and discerning about medical interventions for their children especially in case of weakness, high fever and paralysis. The inactivated poliovirus vaccine (IPV) provided to children between 2 to 8 months . Polio vaccination has been affected by the individual level of household education. The 56.86%, 38.38% and 1.46% individually were not received Polio 1st vaccine from 4.0 %(n=2738). The 52.85%, 41.62% and 1.39% were received Polio vaccination individual levels of education by Polio campaigns from 29.36% (n=19890). The 56.80%, 38.36% and 1.26% individually were not received Polio 2nd vaccine from 5.8% (n=3954). The 52.85%, 41.67% and 1.40% were received Polio vaccination individual levels of education by Polio campaigns from 29.18% (n=19764) (Figure 2). The 57.17%, 37.98% and 1.18% individually were not received Polio 3 vaccination from 8.11% (n=5497). The 52.69%, 41.78% and 1.42% were received Polio vaccination individual levels of education by Polio campaigns from 28.89% (n=19572). There are lots of tribal areas of Khyber Pakhtunkhwa and interior Sindh in Pakistan still not aware from Polio vaccination and even their children have not taken vaccine on regional bases. Additionally, households’ lack of awareness and knowledge indirectly distress on children’s health, also some of the negative religious aspects does not determine the social health views . The illiteracy rate (Figure 2) of Polio 1st vaccine, it’s 33.56% greater from middle level and 97.93% on higher level in case of No (The questionnaire have been distributed in four scale; Yes on card, yes on recall, No, Polio campaign). So lack of household education their children hadn’t received the Polio vaccination. Also a 20.70% and 97.30% individual increase from middle and higher level of education (In the Polio 2nd vaccine greater 32.45% from middle level 97.77% higher level in case of No, also in Polio campaign illiterate level greater 21.11% from middle and 97.33% from higher level same as like Polio 3rd vaccine; 33.56% and 97.93% in case of No and 20.7% and 97.30% in Polio campaign). The Polio vaccinations also affected the individual level of education. The Figure 2 indicates width of children by red line which shows the children who did vaccination yes on recall, dark cyan line shows polio campaign, black line shows yes on card and blue line shows no vaccination records in different provinces. The red line WHO is undertaken by 10,000 trainers along with 6000 lady health workers (LHVs) and more than 100,000 provide service region wise . 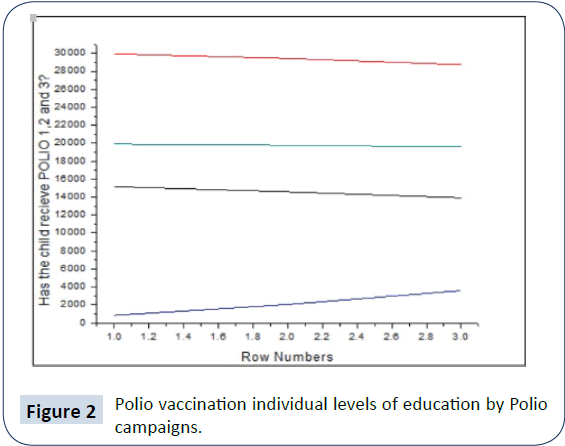 Figure 2: Polio vaccination individual levels of education by Polio campaigns. The Hepatitis B  vaccine has also been affected by the individual level of education. The 55.34%, 39.52% and 1.20% individually were not taken HB 1st, 2nd and 3rd vaccine (2,4 and 6 months) from 96.6 %(n=65450) (The 55.34%, 39.53% and 1.20% individually were not received HB 2nd vaccine from 96.6 %(n=65479). The 55.34%, 39.53% and 1.20% individually were not received HB 3rd vaccine from 96.72 %(n=65509)).The 55.34%, 39.53% and 1.20% individually had not received HB 2nd vaccine from 96.6% (n=65479). The 55.34%, 39.53% and 1.20% individually had also not received HB 3rd vaccine from 96.72% (n=65509). The Figure 3 indicate HB 1st, 2nd and 3rd vaccine from 958 to 63600 children. The red line shows that children have still not received any vaccination in different provinces. The pentavalent vaccine demonstrated a good immunize system in children especially less than two years. It’s protective against of diphtheria, tetanus and Hib, 78% antigen pertussis, 24% petulance and fever, 51% pain, and 36% swelling from the HB vaccine . The lack of Household education has created a major problem for children. HB generally analogous to control immunization system and provide new hexavalent option for pediatric combination of vaccines  mainly in 2 to 4 and 11-12 months. HB vaccine is based on three vaccination course but lack of awareness of household education couldn’t complete three doses to children. Incomplete vaccination have not protect against of neuroprotection . The (Figure 3) illiteracy rate of HB 1st vaccine, and would be greater by 28.58% from middle level and 97.81% from higher level in case of; No, so the lack of household’s education thus the children have not received HB 1st dose (In the HB 2nd vaccine greater 28.56% from middle level 97.82% higher level in case of No and same as like HB 3rd vaccine). The virus infects many infant children and more than 2 million people have been infected and 350 million children and people lifelong carriers. Most of underdeveloped countries still do not provide the HB vaccination for protection . 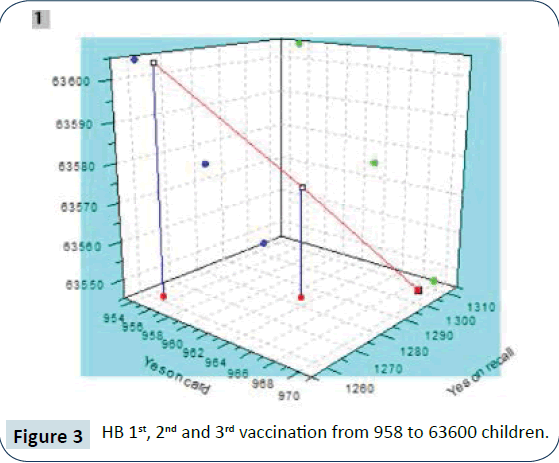 Figure 3: HB 1st, 2nd and 3rd vaccination from 958 to 63600 children. The Measles vaccination has also been affected by the individual level of household education. The 54.48%, 40.27% and 1.27% individually had not received the Measles 1st dose from 36.23 %(n=24538). The 54.52%, 40.24% and 1.27% individually had not received the Measles 2nd dose from 43.83 %(n=29690) (It’s based on different level of educations (illiterate, Middle, Higher level of education)).Furthermore, the Figure 4 indicate Measles 1st and 2nd vaccinations of children in different provinces. The red line shows record children in Measles, Blue line shows vaccination of children on bases of recalling and black line still have not receive any vaccination. The Measles vaccine is protecting against of serious of infections. The Measles have been distributed in two part, its protection against of cough, runny nose along conjunctivitis (pinkeye). As for if it infects in lungs, so it creates pneumonia and also can lead to Tencephalitis, which can cause seizures and brain damage . The (Figure 4), illiteracy rate of Measles 1st vaccine, greater 26.08% from middle level and 97.66% from higher level in case of No (The questionnaire has been distributed in four scale; Yes, on card, Yes on recall, No) so lack of household education their children have not received Measles vaccination (In the Measles 2nd vaccine greater 26.17% from middle level 97.65% higher level in case of No). In 2013 Pakistan more than 100 children infected and lost their life cause of Measles . 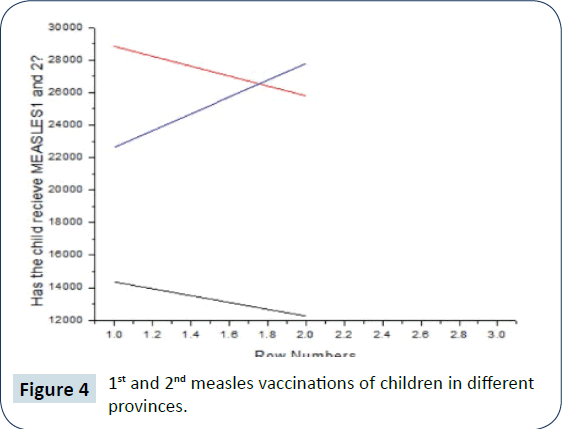 Figure 4: 1st and 2nd measles vaccinations of children in different provinces. The vaccination of Diarrhea has also been affected by the individual level of household education. The 55.42%, 39.44% and 1.21% individually did not suffer from Diarrhea 91.49% (n=61969). The 55.41%, 39.45% and 1.22% individually were consulate Diarrhea from 92.06% (n=62353). 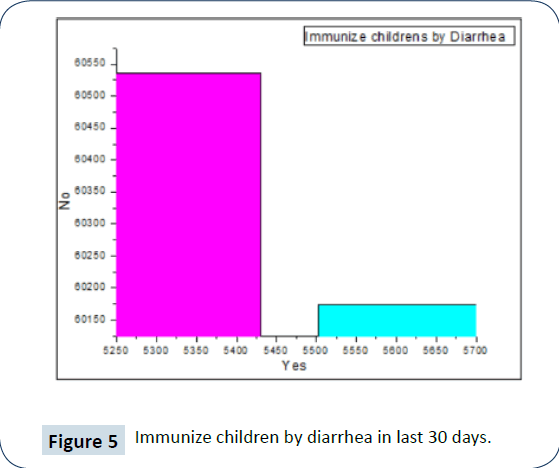 The Figure 5 indicates the immunize children from diarrhea in last 30 days. The children immunized in different methods (Figure 6) 92.09% children consulate with different methods in province (Figure 7). Figure 5: Immunize children by diarrhea in last 30 days. 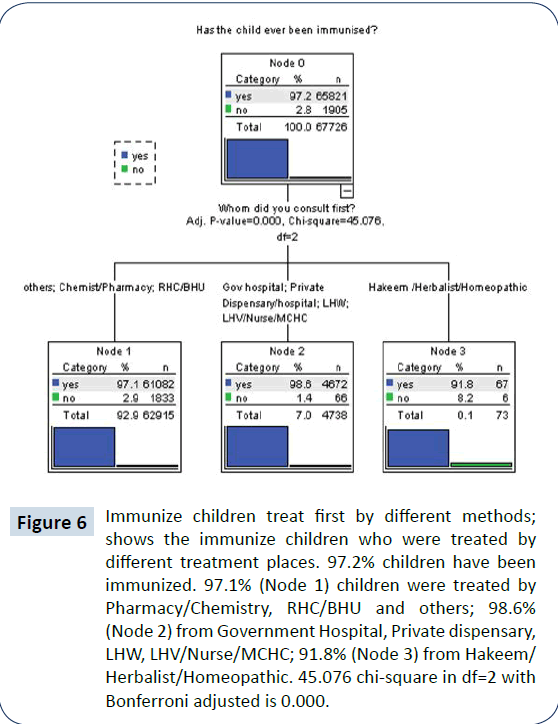 Figure 6: Immunize children treat first by different methods; shows the immunize children who were treated by different treatment places. 97.2% children have been immunized. 97.1% (Node 1) children were treated by Pharmacy/Chemistry, RHC/BHU and others; 98.6% (Node 2) from Government Hospital, Private dispensary, LHW, LHV/Nurse/MCHC; 91.8% (Node 3) from Hakeem/Herbalist/Homeopathic. 45.076 chi-square in df=2 with Bonferroni adjusted is 0.000. 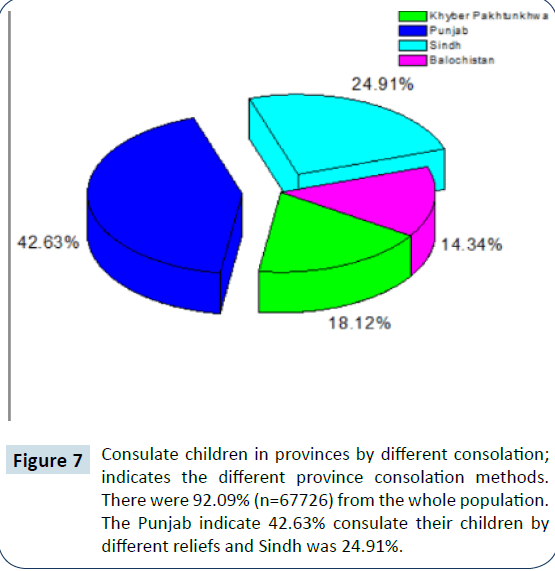 Figure 7: Consulate children in provinces by different consolation; indicates the different province consolation methods. There were 92.09% (n=67726) from the whole population. The Punjab indicate 42.63% consulate their children by different reliefs and Sindh was 24.91%. According to Table 2, there were 8.5% children have been affected by Diarrhea 97.18% (n=67726) and others 91.4% children didn’t immunize from diarrhea. The Pakistan medical association (PMA) in 2011 reported that every minute one child die cause of diarrhea and acute respiratory infection (ARI) and also more than 400,000 (Holistic approach needs to improve health care in Pakistan, especially for infant babies’ district wise. Actuate respiratory infection are most common, where immune system has been weakened by malnutrition. However, especially in rural area lack of child health care)  infant children dies in their first year of life . The illiteracy rate of Diarrhea (Figure 4), greater 28.82% from middle level and 97.80% from higher level in the case of No (The questionnaire has been distributed in four scale; Yes, on card, Yes on recall, No) so lack of household education their children has not received Diarrhea vaccination (There was 28.80% from the middle level and 97.76% from the higher-level increase in illiterate level who’s not consult diarrhea treatment of children’s initially). In this study our sample offers some more valuable finding in regard to understanding the new and dynamic tentativeness of vaccination of children’s along with the importance of household education. The sample size of research is 67,726 was distributed in four districts in Pakistan. Three parameters have been used for vaccination, infant, medium and ≥ 3 year’s children. There were 76.28%, 16.21%, 14.03% infant children inspection in Sindh, Khyber-Pakhtunkhwa, and Punjab individually (Table 3). 13.59% and 12.66% medium ages of babies’ inspection in Punjab and Khyber-Pakhtunkhwa.43.30% (28496) children had been immunized in Punjab from 36 districts. 97.18% (65,821) household used different methods of immunization for children and 2.81% (67,726) even didn’t use any immunization methods for children. And 21.66% household children based on only Polio drops through campaign from 97.18% sample of population individually. Therefore, vaccination campaigns in Pakistan reduce the death rate of children in infant ages. The pattern of immunization; for separate vaccination, for joint vaccination combo, for joint vaccination Penta, only polio drops through polio campaign, and only BCG age less than 6 week using for vaccination. In which 21.66% household based on only Polio drops through Polio campaign from 97.18% sample of population individually. Therefore, vaccination campaigns in Pakistan reduce the death rate of children’s especially in ages of 1-3 months. Table 3: Demographic of provinces. Also, it indicates 97.16% of children who were immunized from 36 districts 29.91% had a card for their children. The 27.34% vaccinate BCG by card and 48.27% household call for immunization (Table 2). If the health department of Pakistan provides vaccination services in rural area so can easily control diseases. However, five vaccination courses will provide without BCG likewise, Polio, Measles and Tetanus respectively. Global Alliance for Vaccines and Immunization (GAVI) support vaccination with EPI, Japan International Cooperation Agency [JICA], United Nations Children Fund [UNICEF], World Health Organization [WHO] and World [WB]). Government of Pakistan providing just 12% copayment for BCG, pentavalent, measles and polio vaccine for routine immunization in rural area . 25.80%, 27.81% and 29.37% children haven’t receive DPT/Combo/ Penta 1st, 2nd and 3rd dose by campaigns, only 47.56%, 46.60% and 45.93% were vaccinated by recall. Immunization is mainly managed by EPI and government of Pakistan contribution is 20% with the support of GAVI but needs more support comparatively in 2008 USD 234 million was spend on child vaccination. The death rate increased in 2005 (8% to 10% from developed countries) so a 34.18% increase in funds  . By financial expects require $6 to $18 per infant by 2010. And it rising up to $30 per infant by 2015 so without support of GAVI the health department of Pakistan couldn’t provide vaccination (Table 4) . As for 44.20%, 43.45% and 42.43% children received vaccination by recall and only 29.37%, 29.18% and 28.90% received Polio 1st, 2nd and 3rd dose by campaigns. 4.04%, 5.84%, and 8.12% household children didn’t receive any vaccination because of illiteracy. The previous research identifies the value of the districts, while coordination officer established by EPI and human resources and bridge financing was under provision purview therefore conflicts in the vaccination program and surveillance of EPI activities resulted in poor coordination. Therefore if the districts wise clear the health indicator so all types of household utilize the immunization campaign and now very well for care of children . There were 96.64%, 96.68% and 96.73% household children didn’t even receive any HB 1st ,2nd, and 3rd dose and 2.91%,1.42, and 4.41% only vaccinated. The Pakistan medical research council 7.6% and 4.8% patients infected in Hepatitis B and C. it indicates that more than 90% household children didn’t take any vaccine so need to improve by the state level. Pakistan cannot afford such cost in the rural areas, where they survive under living scale . As for 36.23% and 18.08% household children have not receive any Measles 1st and 2nd dose, only 42.58% and 38.08% have received by recall. Measles vaccination relies by the health worker, public authority and international supporting bodies. More than 1 million children in the district wise vaccinated by support of UNICEF and coverage rate 100% in under the age of 5. There in this research the results show fewer effects but directly from campaigns. As for by the lady health worker provide services in 113 districts individually but it funding bodies increase LHW in each district region so Pakistan can whitewash Measles 1st and 2nd . There were 91.50% children had been affected by diarrhea in 113 districts and only 7.93% were vaccinated and 92.07% children were not even treated, and 93.62% children didn’t even receive ORS, 5.75% were purchased and 0.62% were treated by homemade prescriptions. 2.195% children were killed every day, cause of Diarrhea. It prevents to focus on pure water (88% diarrhea only cause of unsafe water) and unhygienic food. 91.50% patients infected and they don’t have knowledge to seek help for their children form Diarrhea 11% children are killed only by Diarrhea compared to Malaria, AIDS, Meningitis, Pneumonia, Measles etc. . This study is identify to the basic need of vaccination by household literacy rate and immunization system, which is not enough to eliminate the sickness in children- and is much more aligned with dissatisfaction with government, local communities, negative aspects of religious and development communities [39-41]. Pakistan has eliminated Polio from its root but still not able to eliminate in triable areas cause of political leaders and BHU. Regarding this research HB is violated badly, more than 90% patients seriously sick and the death ratio is 1:10 children but government is depending on GAVI and WHO funding. According to the World Bank (2014) report, more than 29.8%  people living below of economic scale , therefore they don’t provide concern about children’s vaccination, they find resources for accomplishing his/her family basic needs. Although, the government should be responsible for health and security along with economic scale . This study points to that, the potential importance of children’s vaccination and their household growth by education and finances. Although, the government should be responsible for health and security, but uncertainly in Pakistan some corrupt departments taking huge funds from the World Bank (WB) on the behalf of , above mentioned vaccinations but not used properly, even not highlighted the actual number of children in, per house, other side BHU units and vaccination campaigns does not even complete vaccination courses. Therefore, infected number of children increases day by day. The health departments are taking huge funds from indirect resources but are not utilizing even 10% to 20% on health. Our study suggests that if government provides vaccination services to each district and regulates the financial resources at the global level so death rate of children will be reduced. And also, provide the services of education to households because they are responsible for their family, if they are well educated so they can treat very well and know about the all importance of vaccine. Furthermore, to monitor all health department units individually by national accountability with the coordination of community members women should be provided training and must be provided, the opportunity individually, in each district. Regarding research analysis, if the HB vaccination cost is higher in the international market so why the government of Pakistan is not taking alternative of HB vaccination from China in the form of herbal. The government should provide more than a 70% subsidy on vaccination campaigns- as Chinese herbal medicine has a 37% lower risk . Also, the security issues control by district level and arrange table talk to all the anti-government groups, who’re against the vaccination, with Islamic scholars who provide the pure literature in all districts and importance of vaccinations. Hussain I, Mach O, Hamid NA, Bhatti Z S, Moore DD, et al. (2018) Seroprevalence of anti-polio antibodies in children from polio high risk area of Afghanistan: A cross sectional survey 2017. Vaccine 36: 1921-1924. UNICEF. Immunization and pentavalent vaccine. UNICEF. Diphtheria tetanus and pertussis vaccine supply update. Sarah Nam DT (2015) Eradicate Polio. In A. Kearney (Ed.). Mohammed A (2018) Expanded programme on immunization. Immunization.Pakistan polio update (NEOC). Pakistan GO (2018) Pakistan polio update (NEOC). Steel FGK, Blendon RJ, Haydarov R, Lodge IW, Caporello H, et al. (2013) Threats to oral polio vaccine acceptance in Somalia: Polling in an outbreak. Vaccine 36: 4716-4724. Vander BM, Wyns C (2018) Fertility and infertility: Definition and epidemiology. Clin Biochem pii: S0009-9120. Asfaw AA (2018) The distributional effect of investment in early childhood nutrition: A panel quantile approach. World Development 110: 63-74. Roelsgaard E, Christensen H, Iversen E (1957) BCG Vaccination programme in Pakistan. Bull World Health Organ 17: 188-200. Hasan Z, Irfan M, Khan JA, Jahangir SK, Haris M, et al. (2012) BCG vaccination is associated with decreased severity of tuberculosis in Pakistan. Int J Mycobacteriol 1: 201-206. Moller HBK, Christensen H (1954) BCG-vaccination campaign in Aden Colony. Bull World Health Organ 10: 113-126. Bajwa A (2016) Pakistan social and living standards measurement survey. Government of Pakistan. Miedema SS, Haardörfer R, Girard AW, Yount K M (2018) Women’s empowerment in East Africa: Development of a cross-country comparable measure. World Development 110: 453-464. Durrani AH (2014) Polio crisis deepens in Pakistan, With New Cases and Killings, Polio Crisis, New York edition p. 3. Zaffran M (2018). Pakistan has just one new polio case, but isn’t declaring victory yet, Polio Case. New York edition p. 1. Johri M, Subramanian SV, Sylvestre MP, Dudeja S, Chandra D, et al. (2015) Association between maternal health literacy and child vaccination in India: A cross-sectional study. J Epidemiol Community Health 69: 849. Laurie Barclay M (2013) Childhood BCG vaccine may continue to protect adults from TB. In BCG (Ed.) Medscape Medical News. Qasim M (2016) TB kills over 70,000 people every year in Pakistan. The News p. 2. Schmidt D (2018) CDC lies about possible association between DPT vaccine and autism, World Mercury Project reveals. Natural Health 365. Elana PB-JM (2018) Polio Vaccine (IPV). Salamati P, Razavi S (2016) The social determinants of polio in Pakistan. Travel Med Infect Dis 14: 639-640. Owais A, Khowaja AR, Ali SA, Zaidi AKM (2013). Pakistan's expanded programme on immunization: An overview in the context of polio eradication and strategies for improving coverage. Vaccine 31: 3313-3319. Amer S (2011) One child dies every minute in Pakistan: Report, Child immunization. The Express p. 3. Sharma H, Yadav S, Lalwani S, Kapre S, Jadhav S, et al. (2013) Antibody persistence of two pentavalent DTwP–HB–Hib vaccines to the age of 15–18 months, and response to the booster dose of quadrivalent DTwP–Hib vaccine. Vaccine 31: 444-447. Silfverdal S-A, Icardi G, Vesikari T, Flores S A, Pagnoni M F, et al. (2016) A Phase III randomized, double-blind, clinical trial of an investigational hexavalent vaccine given at 2, 4, and 11–12 months. Vaccine 34: 3810-3816. Bilal S R, Mariyam I, Rahat K, Shahid A, Ishrat I, et al. (2013) A survey report on measles in Pakistan annals 19: 288. Afzal S, Naeem A, Shahid U, Noor S W, Khan U, et al. (2016) Effective role of lady health workers in immunization of children in Pakistan. Pak J Med Sci 32: 1500-1505. Tayyeb M, Navaratne K V (2012) The expanded program on immunization in Pakistan. Khan A, Khan A (2012) Childhood immunization in Pakistan Research and development solutions. Logan B, Colin S, Victor G, Tayyeb M, Haq I (2011) Cost-effectiveness and Financial Consequences of New Vaccine Introduction in Pakisan. HNP Discussion Paper. >Husain S, Omer (2015) Routine immunization services in Pakistan: Seeing beyond the number. East Mediterr Health J 22: 202-203. Sadia A, Aftab A (2015). Viral hepatitis in Pakistan: Challenges and priorities. Asian Pac J Trop Biomed 3: 2. Malik A S (2015). A partnership to help vaccinate children against measles in Pakistan. Islambad Unicef. Liu L, Johnson HL, Cousens S, Perin J, Scott S, et al. (2015) Diarrhea: Common Illness, Global Killer, Child Health Epidemiology. U.S.Department of Health and Human Services. Liu L, Johnson HL, Cousens S, Perin J, Scott S, et al. (2012) Global, regional, and national causes of child mortality: An updated systematic analysis for 2010 with time trends since 2000.Lancet 379: 2151-2161. Guzman M, Ocampo J A, Stiglitz J E (2018) Real exchange rate policies for economic development. World Development 110: 51-62. Merry C (2018) Chinese Herbal Medicine in Chronic Hepatitis B Infection. Integrative Medicine Alert 21: 10-12.